"On the seventh of this month one of the most noteworthy and highly esteemed men of his time died, the royal Konzertmeister Franz Benda …. It is generally known that he was one of the greatest musicians, and that upon his instrument, the violin, he created an epoch." This is how a Berlin paper announced the death of Franz Benda on 7 March 1786. One of the features of both his playing and his compositions was their true 'cantabile' character, which was noted, for instance, by Charles Burney: "scarce a passage can be found in his compositions, which is not in the power of the human voice to sing". This analogy with singing is appropriate: Benda was educated as a singer, and even after he had been appointed as violinist in the court chapel in Berlin he still sang arias on a regular basis at court. Through his compositions, his playing as well as his activities as a teacher he was considered one of the fathers of the German violin school - together with Johann Georg Pisendel who worked in Dresden. One of his pupils was Johann Peter Salomon, who was responsible for Haydn visiting London twice. His great skills notwithstanding Benda seems to have been a modest man. He didn't bother to admit his lack of knowledge of counterpoint. He was also willing to be influenced by his colleagues in Berlin, Johann Joachim Quantz and the Graun brothers. Also important was the oeuvre of Vivaldi, which he studied thoroughly. It isn't always easy to know exactly which compositions were written by Franz Benda. Very little of his oeuvre was published in his lifetime, and often pieces were just signed with 'Benda', without specification as to which member of this large family of musicians was intended. 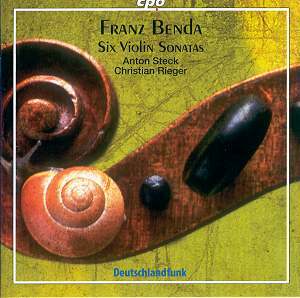 This disc also contains a sonata whose authorship is not firmly established: the Sonata in E flat, but Anton Steck is sure it is by Franz Benda. Considering the reputation of the composer in his time and the quality of his sonatas it is surprising that this is the first recording ever completely devoted to his violin sonatas. But then maybe the technical requirements are such that not that many violinists dare to play them. This disc shows the astonishing skills Franz Benda must have had as most of the sonatas here are technically very demanding. Anton Steck impressively meets all the requirements. He is clearly the master of this material which gives him the opportunity to concentrate on interpretation. Most of the sonatas are in three movements, which are ordered according to the contemporary fashion: slow – fast – fast. There are two exceptions: the Sonata in F begins with 'un poco allegro', but other sources put the second movement, an adagio, first. The Sonata in E flat, which was already mentioned, also begins with an 'allegro'. Usually the second of the two fast movements is the fastest and most brilliant, and Anton Steck and Christian Rieger manage to realise enough difference in tempo to create a rise in tension and excitement – something Franz Benda undoubtedly intended. In this context one should realise that the Italian opera was the dominant form. It isn't too far fetched to assume the gradual rise in brilliance and excitement is influenced by the theatre. Benda was known for the cantabile character of his playing and of his compositions. There is certainly plenty of that in these sonatas, in particular the slow movements. They also reflect the shifts in affections which are so characteristic of the style of the 'Empfindsamkeit'. The fast movements are impressive both for their virtuosic character as for their strong contrasts. The last movement on this disc – the 'andante con variazioni' with which the Sonata in E flat ends – is a striking illustration of the character of Benda's violin sonatas. It ends this disc in style, and demonstrates Steck’s impressive technical and interpretative qualities. And let us not forget Christian Rieger, who gives excellent support and delivers a powerful and energetic realisation of the basso continuo part. The booklet contains an informative essay by – well, that is a little confusing: the German text gives Bernhard Moosbauer as author, the English and French translation Anton Steck. A minor error in an otherwise exemplary production.